We offer a wide selection of heavyweight t-shirts from leading brands like Hanes, Gildan, Anvil, Fruit of the Loom and more. Most of the brands offer two heavy weight categories. The lighter of the two weights is the 5.0 to 5.6 oz range. 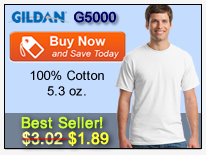 Our most popular heavyweight t-shirts in this range are the Gildan G5000 (5.3 oz) and the Fruit of the Loom 3930 (5 oz.). 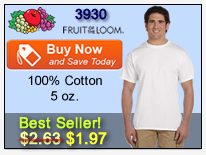 Other shirts in this heavy weight range would be the Hanes 5280, and the Jerzees 363. While these are all considered to be heavyweight t-shirts, you can also upgrade to the 6.0 to 6.1 oz. range, which is an even heavier weight. 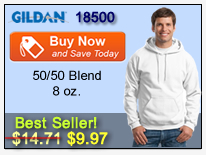 The most popular of these heavier weight tee shirts is the Gildan 2000 with over 50 colors to choose from. 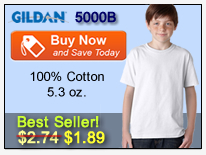 One of the advantages to the Gildan 2000 heavyweight t-shirt is the fact that it has several counterparts such as the 2000L ladies t-shirt, the 2000T Tall option, and the 2000B youth heavy weight tee. This makes it convenient when you need shirts for a large variety of ages and sizes. Below are several of our best heavyweight t-shirts. These are all 6.1 oz weight shirts and are of the highest quality available. 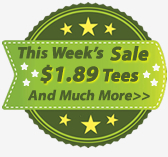 You can browse our entire line of t-shirts here most of which are heavy weight t-shirts. If you have any questions regarding the various heavyweight t-shirts that we offer, don't hesitate to contact us.